The Province of Hyderabad came into existence on March 25, 2007, becoming the 7th Province in India with the bifurcation of the Province of Central India into Province of Hyderabad and the Province of Pune. The inauguration of these two Provinces took place on that day at Little Flower High School, Hyderabad. The expansion of the Montfort Brothers of St. Gabriel in India is a long story of struggles and successes. Growth may have been slow, but sure and steady. From the humble beginnings of the revered pioneers in 1903, Brothers kept persistently marching ahead and the result was that the “District of India”, of the pioneering times, which eventually became an independent “Province of India” in May 1948, kept growing and expanding so fast as to make it too vast, to be efficiently administered and animated by a single Provincial team. The Province came to be divided into three administrative Regions for greater efficiency and further expansion. Thus came into existence the Region of Central India (‘District of Hyderabad’) on 1st May 1967, headed by a Regional Superior assisted by a Regional Council of two members, appointed by the Central Administration after consultation. Though the Region was a ‘Self governing dominion’, it was grouped along with the other two Regions of South and North, under the authority of the ‘Provincial of India’. Bro. Vincent was appointed as the Regional Superior (1967-68) with Bro. Stansilaus Joseph and Bro. Eugene Mary as Councillors and Bro. Felix as the Regional Bursar. In 1968 Bro. Felix was appointed as the Regional Superior (1968-70) with the same councilors continuing and with Bro. Dominic Mary as the Regional Bursar. From 197-75 Bro. Vincent was the Regional Superior while being the Director of Boys Town, and he was assisted by Bros. Julian, Berchmans, John de Britto (also Regional Bursar) and Bro. Montfort as the Councillors. The Rigion of Central India comprised of the whole of Andhra Pradesh with the following institutions. On June 01, 1975, the Province of Central India came into existence with Bro. Vincent de Paul as its first Provincial Superior. He had Bros. Berchmans Joseph, Celestine Joseph and John de Britto as Councillors and Bro. V.K. Stephen as Provincial Bursar. From 1977-1980 Bro. Felix was the Provincial Superior. His Councillors were Bros. Celestine Joseph, Lambert, Berchmans Joseph, John de Britto, Claude and Montfort of the Cross. From 1980-1986, Bro. Celestine Joseph was the Provincial Superior. During his 1st term, the Councillors were Bros. Berchmans Joseph, Vincent de Paul, Felix, Mani Mekkunnel, James Pannivelil and T.A. Joseph. Bro. George Pralel was Provincial Bursar and Local Superior of the Provincial House, Montfort Bhavan. In 1983, Bro. Celestine was reappointed Provincial Superior. The Councillors were Bros. Mani Mekkunnel, Berchmans Joseph, Thomas Aquinas, James Pannivelil, K.K. Thomas and K.M. Joseph. Bro. Mani Mekkunnel took charge as Provincial Superior on March 25, 1986. His Councillors, who ably assisted him, were Bros. K.K. Thomas, K.M. Joseph, T.A. Joseph, Thomas Aquinas, Vincent de Paul and Davis Vadassery. Bro. Alexius was Provincial Secretary and Bursar. Bro. Thomas Kizhakkekara took charge as Provincial Superior in March 1992, the Councillors were: Bro. T.A. Joseph, Celestine Joseph, T.K. Jose, M.M. Francis, Thomas Aquinas and K.M. Joseph. Bro. Raymond was Provincial Bursar and Bro. Jimmy Kuriakose was Provincial Secretary. – People’s Initiative Network (PIN), Hyderabad. During Bro. Thomas Reddy’s second term of 3 years as Provincial, the Councillors were: Bros. T.A. Joseph, Varghese Theckanath, John Kallarackal, Jose Vetticattil and M.A. George. Bro. T.K. Jose was Provincial Bursar and Bro. Alexius was Provincial Secretary. From 2000 Bro.Lambert, who was appointed Province Formation Director as well as National Director of Formation, also helped in the animation of the Province. Bro. Varghese Theckanath took charge as Provincial Superior in March 2001 with the following Councillors: Bros. Prabhakar Reddy, Bro. K.M. Joseph, Jose Vetticattil, Franky Noronha and M.K. Mathew and Bro. M.A. George as Provincial Bursar and Bro. Alexius as Provincial Secretary. During the First Session of the XIII Provincial Chapter of the Province of Central India (11-14 December 2003), the Provincial Administration was mandated to initiate a process of restructuring the Province. On the recommendations of the Second Session of the Provincial Chapter (25-29 May 2005), the Superior General and his Council, acting collegially, on September 21, 2006, decided to create the Provinces of Hyderabad and Pune with effect from March 25, 2007, by bifurcating the Province of Central India. On September 25, 2006, the Superior General and his Council approved the lists of Communities and the lists of Brothers of the two future Provinces, as they were submitted by the Provincial Superior and Council of Central India. It was decided that the District of East Africa would be attached to the Province of Hyderabad. Further it was decided that in March, 2011, Brothers would have the possibility of expressing a definite choice of either the Province of Hyderabad or the Province of Pune. The Provinces of Hyderabad was inaugurated on March 25, 2007 at Little Flower High School, Hyderabad in the presence of Archbishops Marampudi Joji of Hyderabad and Abraham of Nagpur, Bro. Rene Delorme, Superior General, Bro. Jose Thottiyil, Vicar General, Bro. John Kallarackal, Asst. General and Bro. 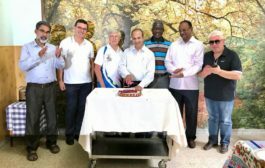 Varghese Theckanath, the outgoing Provincial Superior, the two new Provincial Superiors, their Councillors, and a large number of Brothers and friends.